Click-to-Run is the technology used to install Office 365 subscription and most versions of Office 2013 and newer. Windows Installer technology (MSI) was used to install the volume license editions of older versions of Office 2016 and older, such as Microsoft Office Professional Plus and Microsoft Office Standard. 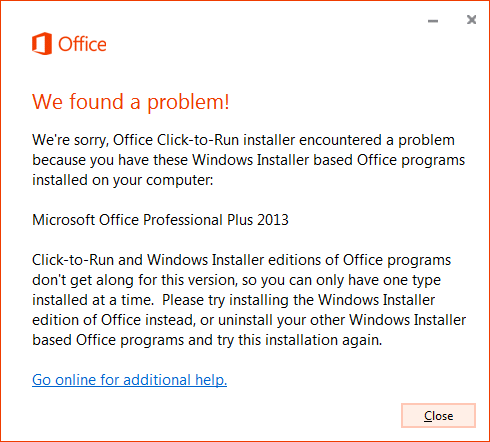 You can't install the same version of Office products that use two different installation technologies installed on the same computer. This also applies to standalone applications like Access, Visio, Project, Skype for Business, or OneDrive for Business. Note: In some cases, you also can't have two different versions of Click-to-Run applications on the same computer. For more information, see "Stop, you should wait to install Office 2016" error. Follow the steps in Uninstall Office from a Windows computer to remove the Windows Installer version of Office. Retry the installation of Office you were doing when you got the error message. If you have a volume license for Project 2016 or Visio 2016 and you’re trying to install the Click-to-Run version of Office 365 ProPlus, you can use the Office Deployment Tool to download and install the Click-to-Run perpetual (stand-alone) versions of Project 2016 or Visio 2016. See Use the Office Deployment Tool to install volume licensed editions of Visio and Project.